What happens if you don’t report payroll information on time? Blog » Real Time Information (RTI) » HMRC Real Time Information – What happens if you don’t report payroll information on time? 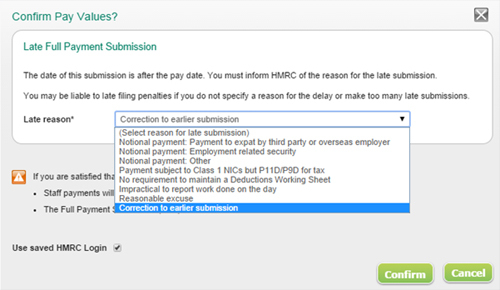 HMRC Real Time Information – What happens if you don’t report payroll information on time? In early September, HMRC provided an update on how they are going to penalise employers who do not submit their payroll information on time. Essentially, if you are an employer with more than 50 employees and don’t submit your payroll on time from 6th October 2014 you could incur a monthly penalty of £300. (For employers employing fewer than 50 employees, penalties will not come into play until 6th March 2015). What should you do if you submit a FPS after your employees pay day? Under HMRC’s Real Time Information (RTI) legislation you should be submitting a Full Payment Submission (FPS) ‘on or before the payment was made’. If you do happen to submit after the payment was made to an employee, HMRC are now expecting you to submit a Late Full Payment Submission Reason. If HMRC disagree with this, or you don’t submit an FPS they may send you a late filing notice through PAYE Online and your business may be subject to a penalty.